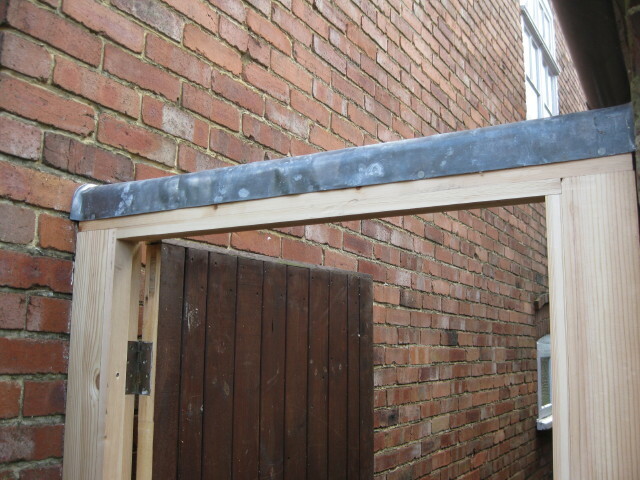 Replacement of a side gate frame reusing the gate, note the lead ‘hat’ on the new frame, this will prevent the top of the frame from rotting again,also i fix the frame about 1/2″ ( 12mm) off the ground so that no moisture can creep up from ground level, these two simple precautions will extend the life of the timber frame considerably, indeed it will probably last with a proper paint finish until the end of this century! 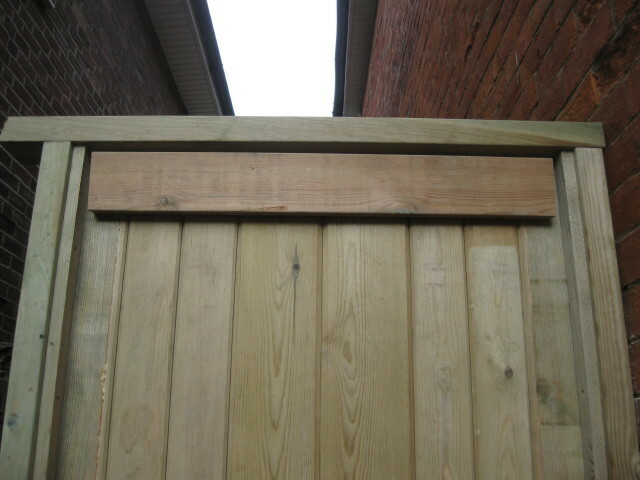 Images of a Framed Ledge and Braced gate made from tannalised Redwood with galvanised fittings a gate like this is pretty well bullet proof when it comes to weathering and should give at least 30yr service life. 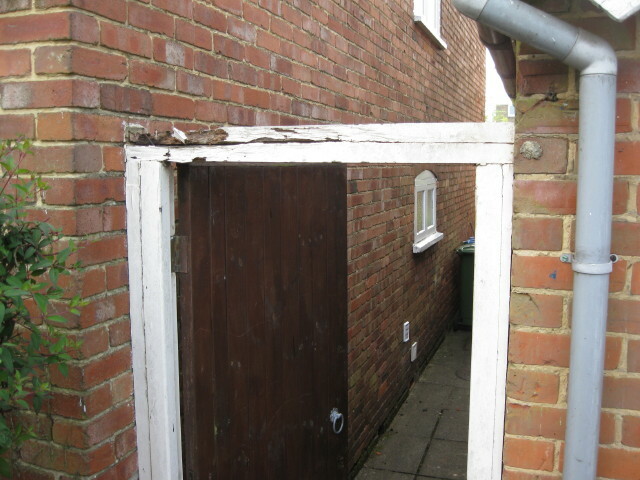 I have written this in response to the number of enquiries I receive from home owners who say’ the door is only x yrs old and its falling apart’ and I take a look at a door tired before its time, rotten at the base with joints coming apart. 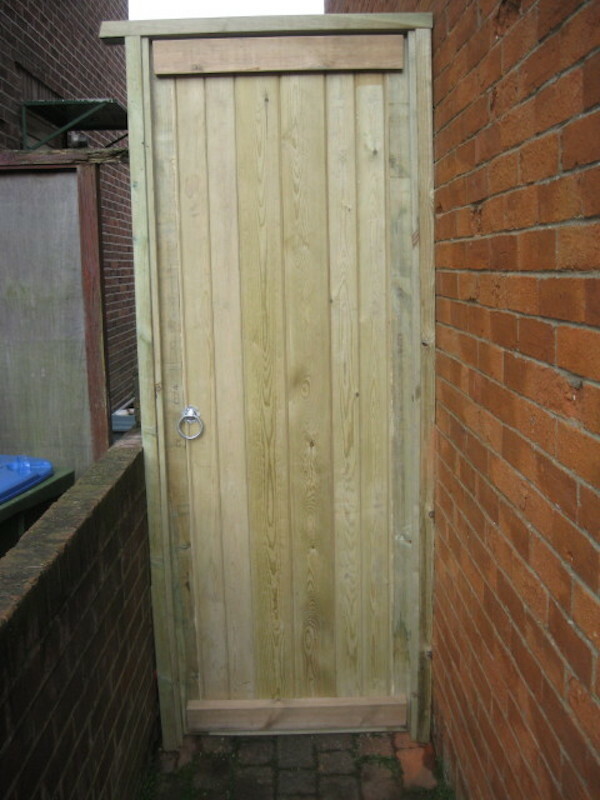 Wooden exterior doors must be adequately protected from both rain and direct sunlight other wise they will either warp, swell, rot or become ‘ill fitting’ the veneer on composite doors can split and peel particularly around the joints between the stile and rails, unless adequate protection is applied. A coat of undercoat and a final coat of gloss is not adequate protection. Nor are just a couple of coats of stain or varnish. If you are going to paint your door do it properly, I recommend that you use oil based paints not acrylic if you are not sure read the section on the tin that refers to clean up if it states that brushes can be washed out in water its acrylic if they need to be washed out in white spirit or turpentine then its oil based. Do not mix the two some say you can paint oil over acrylic why risk it? In order to protect your door one must prepare all faces including the top and bottom along with all the cut outs, so the locks, any handles and hinges to the door need to be unscrewed and taken off, with a primer I use a marine product giving 3 coats with the first coat being thinned with thinners by 20% or so, the aim is not to apply a coat of primer so thick as to cover timber, primer should be applied sparingly enough as to only just hide the timber by the third coat. You may need to sand down after the third coat with a 120 or 180 grit paper the number 120 or 180 will be on the back of the paper, that refers to the number of particles per square inch the higher the number the finer the grit. I suggest two options because some paints may clog the 180. 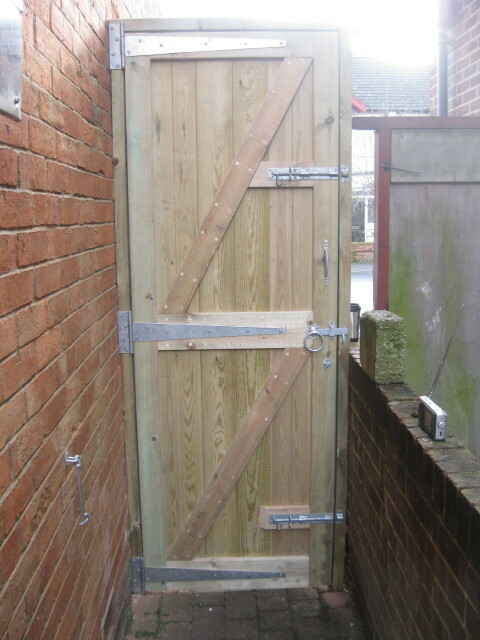 The door can now be rehung and the locks refitted. 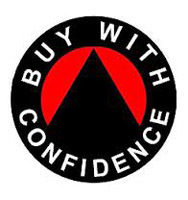 It is not a good idea to leave a door in its primed state for weeks before embarking on the next stage, over coat time of primers should be kept to a minimum but it must however be not only dry but hardened off so no more than a week or so and you should be alright. Next the undercoat, two coats, not forgetting the bottom and top of the door, to make life easier a swan necked brush is best for getting under the door and using a small mirror you can make sure that you cover all of underneath. In between coats rub down with 120/180 grit paper. 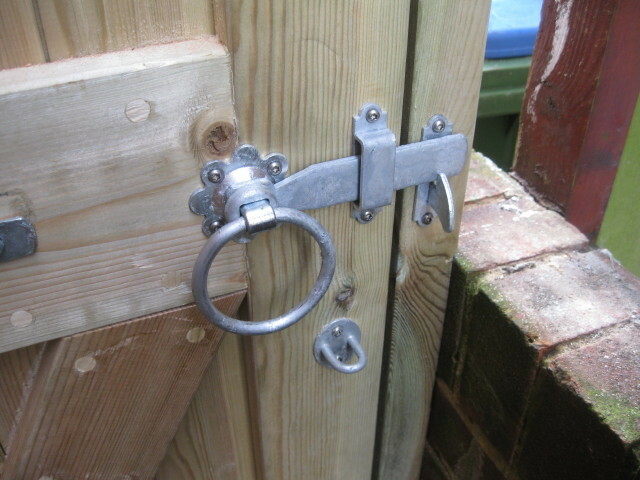 There is no need to undercoat the lock housings or behind the hinges. Don’t leave the door for too long with undercoats on before final coats, over coat times should be kept to a minimum of no more than a week, undercoats can absorb moisture over time. The final coat can be gloss, satin or matt that’s your choice but if the above has been adhered to then you too can have a door that looks as good as the front door to 10 Downing st. bear in mind though that particular door is not wood but a bomb blast particulate, probably plate steel of some kind. With the final coat you may find that only one coat is required that is often the case because all the preparation has been done but if a further coat is required wait a while for it to harden off, a week or so, and a final rub down with a 180 grit before applying the second final. If you paint your door in the sequence above it will last many years you will need to revisit this project in 5 yrs perhaps to check the integrity of the paint work but all the hard work and effort would have paid off and it may be a case of a touch up only. 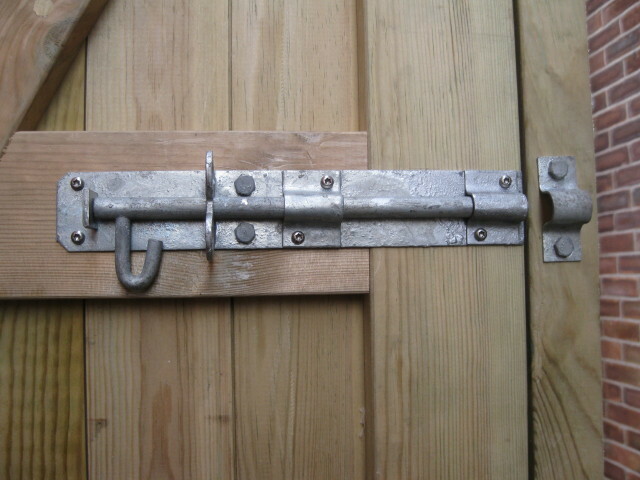 When it comes to staining the same applies regarding the lock housings and behind the hinges for the first three coats, thin coats only, and build up with each coat having a rub down with 120/180 grit, between sanding and applying the next coat also lightly rub down the door with a rag dampened with white spirit if its oil based or dampened with water if its acrylic, this is to remove the dust that may linger in the background and show through to the next coat but do make sure that it has evaporated or dried before applying the next coat. The same goes for varnish I avoid polyurethane varnish if you break the skin of this varnish with a sharp knock water can get behind, and over a short period of time it can start to peel. The final number of coats depends on how true you want the final shade to be but at least 4 and what I do is a further coat after a period of say 6 months which seems to finish off the job nicely. Varnish can really set off a main entrance door but you need to consider using a satin rather than a gloss, gloss varnish has the habit of showing every defect left from applying the stuff and unless you are employing a seriously good painter satin would be the finish of choice. There is a marine product I use from time to time that is a two part varnish system the first being a oil that sits in the wood and the second part being the varnish that sits on top the idea being that water cannot get into the wood because of the barrier presented by the oil and the varnish is the skin. It works well but is time consuming. 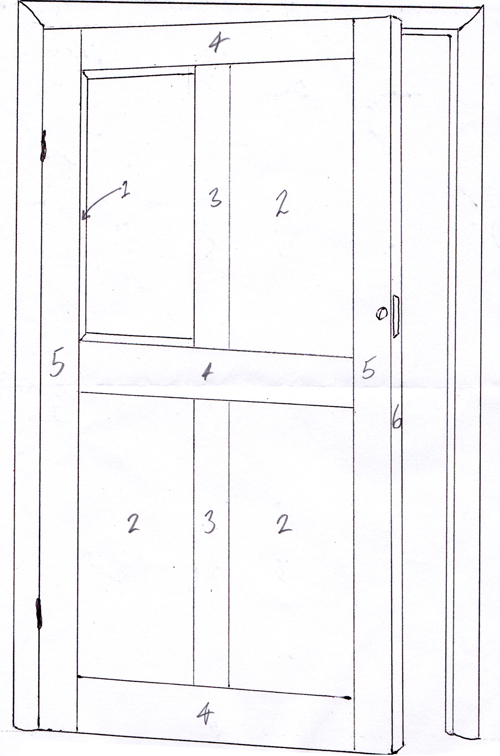 There is a correct method of applying paint ,stain or varnish to a door whether its an internal door or an external one please refer to the diagram the numbers show the logical sequence of application 1, being the mouldings 2, the panels 3, the centre verticals (muntins) 4, the cross rails 5, the stiles and 6, the edges. If you can, consider staining the door from start to finish lying flat the end result is superior as wetting –the pooling of stain that can lead to darker patches- is avoided, but the message of this blog is about protection rather than fine finishes in stains.